To round out Back To School Week, here are my top 10 rules for bento making. They are the rules or philosophies that guide all the content that you see on JustBento. They’ve evolved quite a bit over the years, but they are what I’m happy with at the moment. A version of these rules appear at the top of The Just Bento Cookbook  too. They’re the rules I try to live by in my daily bento life. Sometimes I stray away from them when my life goes haywire - like trying to renovate an old house in a foreign country, and then getting infected by an insect bite which turns into a zombie bite …well you know, things happen. But I when I can return to these rules, I know that life is nice and normal again. 1. My bentos have to be reasonably healthy and balanced. I make sure to include protein and carbohydrates in every bento box. I always add vegetables. Besides being nutritious, they are so colorful! 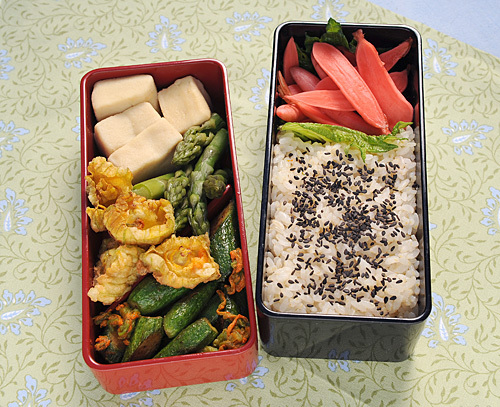 In my bentos vegetables are not an afterthought—they take a starring role alongside the other main ingredients. I sometimes add fruit as a dessert, though occasionally I treat myself to a small brownie or something. 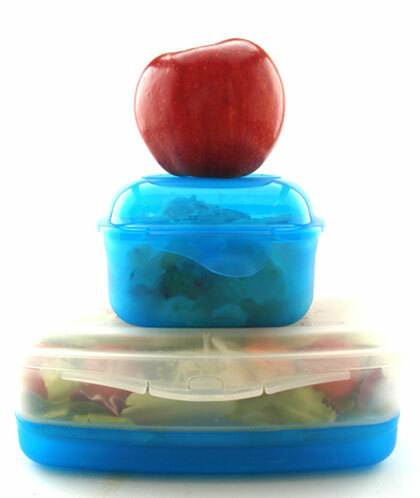 I sometimes see bento boxes online that are not quite balanced. One I saw recently (I’m not going to link to it, since it’s not my objective to embarass anyone) had a little bit of chicken and assorted M & Ms, plus one half of the box was filled with Cheese Whiz. Another one had a whole compartment of candy, some Pocky sticks, and a sandwich. Is that a bento, or a just box of snacks? Some commercially available lunch sets (cough Lunchables cough) may look rather like that, but that doesn’t mean you have to follow their example. I realize that it’s sometimes difficult to pack lunch for picky kids. This is where cute charaben bentos come in - they were originally devised as a means for Japanese moms to get their picky kids to eat healthy food. Why not try some vegetables cut into flowers, or a healthy sandwich with a smiley face, and see how your kids react? Another idea that I talked about previously is to just use stickers . I don’t have the time to spend making multiple items for my bentos, unless it’s for a party or something. I stick to a maximum of four or five different items per box for everyday bentos; many of my bentos contain three items or less. 3. Make sure the bento is tasty. Any bento I make has to taste so good that I’m drooling in anticipation of opening my box at lunchtime. (Sometimes I can’t resist and have lunch early.) I never pack something just because it’s supposed to be healthy. I also make sure that the food I put in tastes good even when cold or at room temperature. Sometimes I carry along an ice pack, but they do add extra weight, so most of my bentos are meant to be eaten at room temperature. 4. 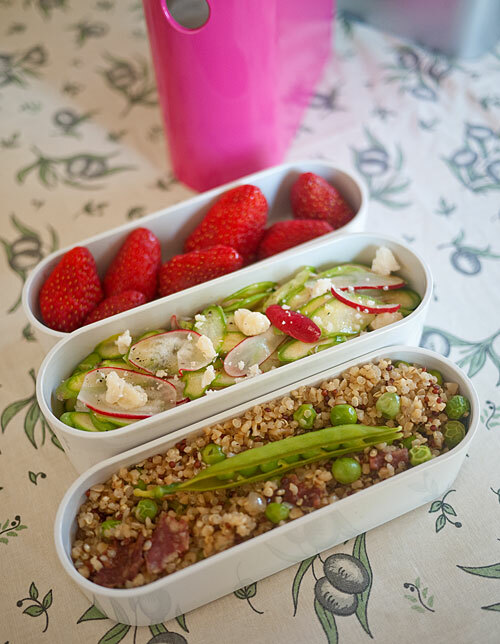 Make the bento, fun, colorful and attractive, but don’t fuss too much. We eat with our eyes as well as our mouths and stomachs. 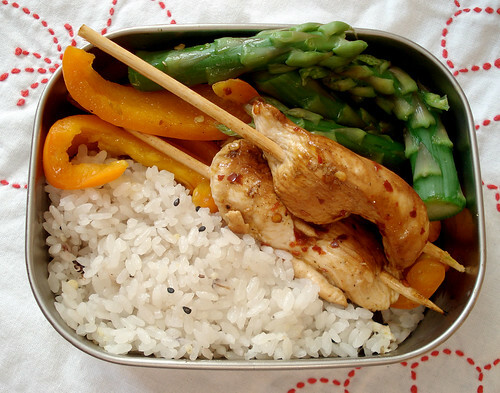 A bento box should look colorful and appetizing. 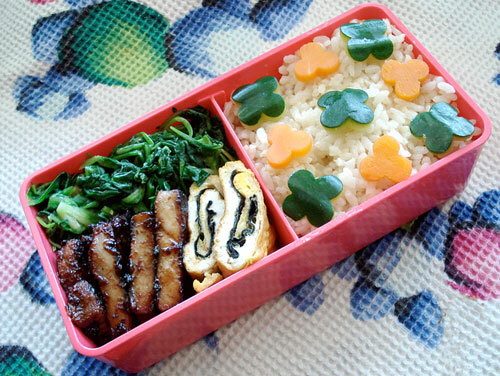 I keep elaborate, time-consuming bento decoration attempts for special occasions. I have a general rule of keeping bento decorating time — the time needed for the addition of things like cutely cut vegetables or decorated rice balls — to a maximum of ten minutes per bento for everyday bentos. Usually it takes me no more than five minutes to add a fun, decorative element. I think that it would be helpful if bento bloggers who post elaborate charaben photos could include the time it took them to make their amazing creations on occasion. I’m pretty sure it takes them longer than the 20 to 30 minutes maximum I allow myself in the mornings (it rarely goes over 20 minutes for one bento, or 25 for two.) I am not an experienced charaben maker by any means, but I’m a pretty experienced bento maker and cook, and for me whenever I try to make a very decorative bento it takes me ages. There’s a joy in creating something beautiful, even if it’s going to be eaten up in a few hours, but to my mind charabens are more akin to crafts rather than everyday cooking, sort of like creating colorfully decorated cupcakes. 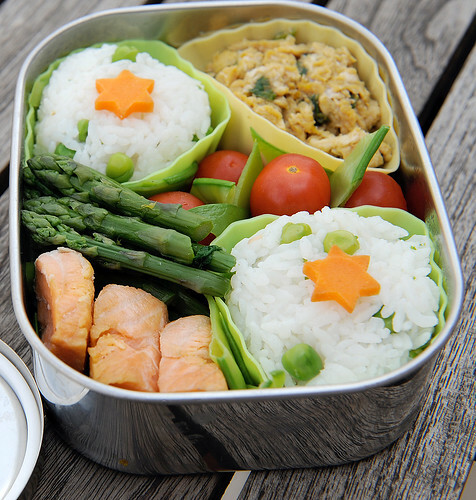 Also keep in mind that a well-balanced, colorful bento can be beautiful on its own without any additional frills. 5. Use seasonal, locally grown, natural ingredients whenever possible. I try to make use of seasonal produce as much as possible. I also try to stay away from pre-made, processed foods. Most of my bentos are made with fresh, natural ingredients - organic and untreated fruits and vegetables, ethically raised meat and poultry, and so on. When I do use processed foods such as canned beans or processed meats, I try to stick to ones that have a minimum of additives. 6. Pay attention to safety and hygiene. When packing food that may have to sit at room temperature for some time before being eaten, it’s crucial to follow proper, safe, bento-packing practices. Try to handle the food with your bare hands as little as possible - use chopsticks and other utensils to arrange your food, or consider using those disposable gloves that commercial food preparers use. 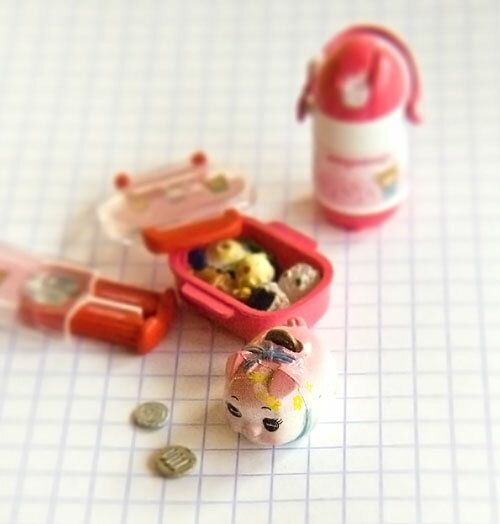 Don’t lick your fingers while you’re arranging your cute little bento-scapes! 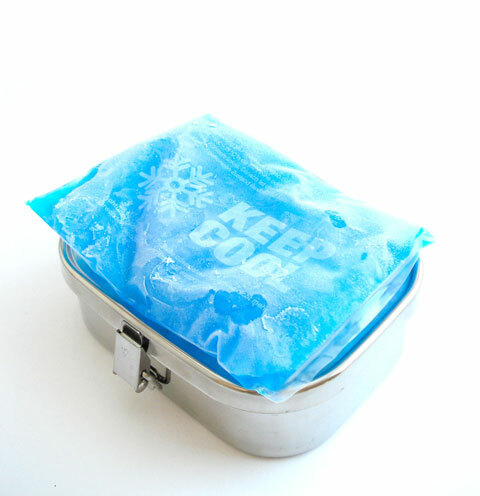 In warm weather or for food that might spoil easily, be sure to use an ice pack. 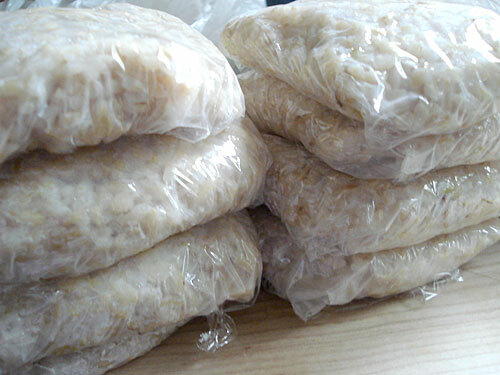 The biggest time waster in the morning is peering through the refrigerator and the cupboards, wondering what to make! I try to spend a few minutes every week planning out my bentos. I may not stick to the plan all the time, but it’s so helpful to have some idea of what to pack beforehand. 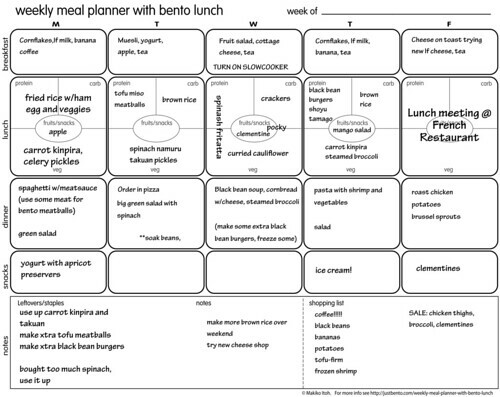 My Weekly Bento Planner  and Weekly Meal Planner  forms may help. 8. Stock up on homemade and store-bought staples. 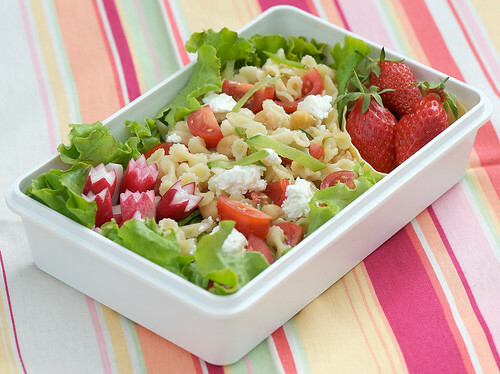 Staples are items that have been fully or half-cooked in advance and that can be packed into a bento box with little or no additional cooking. I try to keep at least a few such items stocked in my freezer, refrigerator, or pantry. Most of my bento staples are homemade—I usually make them when I’m cooking dinner, or when I have some time on the weekends. I have a stock of store bought staples too. See Johbisai: Building Up a Bento Stash . 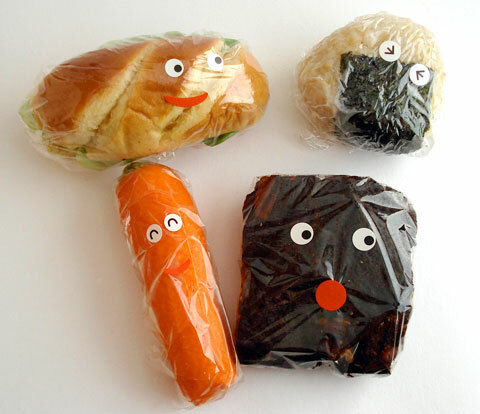 Bringing a bento from home saves a lot of money over buying lunch from a fast food place or eating out. It’s also a great way of using up leftovers which otherwise might go to waste. To help me save even more money, I try to stick to economical cuts of meat and fish, and vegetables that are in season. See also: Bento making: Variety and saving money . 10. Don’t try to replicate Japanese bentos made in Japan, at least not all the time. I love Japanese cuisine above all other cuisines—after all I am Japanese! I don’t try to replicate Japanese bentos that are made in Japan to the letter, however. 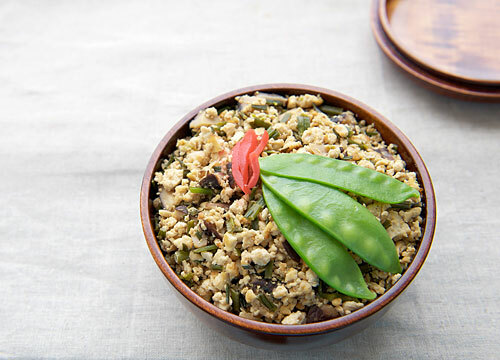 While the increasing popularity of Japanese food worldwide has meant that staple ingredients such as soy sauce and miso are getting much easier - and economical - to buy, many fresh ingredients that are taken for granted in Japan are hard or impossible to get outside of regions with large Japanese expatriate or immigrant populations. And if you can get hold of them, they may be too expensive for the average household budget. For my everyday bentos, I alternate traditional, authentic tasting Japanese-style bentos that have been adapted to use ingredients that are widely available, with bentos that combine various non-Japanese dishes and flavors. That’s exactly what I feature on this site. These rules are more personal rules of mine. They may or may not apply to you. 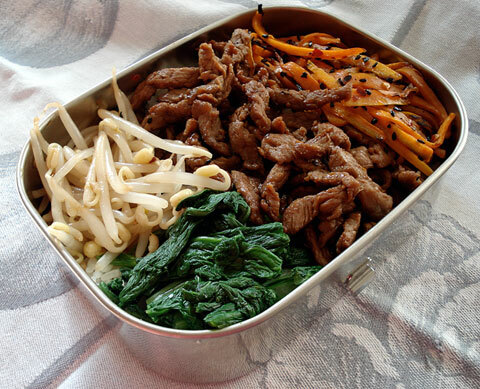 I believe a homemade bento lunch is appealing because it is a healthy, attractive, and delicious meal, made with care and attention, that is compact enough to carry easily to work or school. 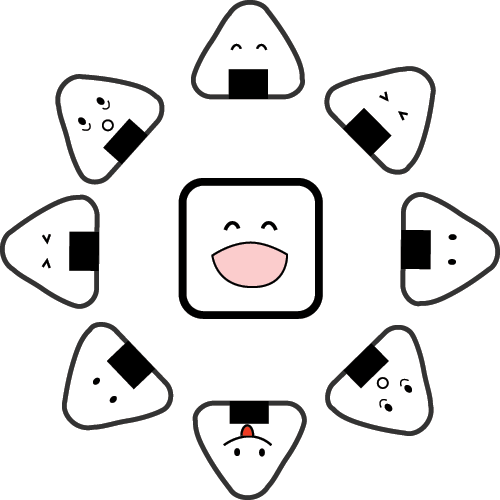 These are the factors that make a bento a bento . A bento doesn’t have to be a work of art using only Japanese recipes, nor should it be simply a thrown-together meal in a plastic container. This is the philosophy that underpins all the recipes, tips and ideas on this site, as well as in my book. Feel free to chime in with your rules, or tell me if you disagree with anything! This is Tip no. 3 of Back To School Week . I hope you’ve enjoyed them and found them useful!